33. 17 Aug 2017 5 page answer to Paul Cozzens' question "How do you test these proposed new aquifers?" 32. 17 Jul 2017 Videos of Joseph Armstrong water witching Wood's Ranch and Sheepherder's Cabin proposed Cretaceous water well locations, with comments and questions. 31. 20 Apr 2017 170420_RECHARGE_WELLS_EAST_OF_CEDAR_CITY.pdf Proposal for CICWCD Meeting 27 Apr 2017 based on Iron County Today Article on 19 Apr 2017. (the wet conditions of this geologic time did reach Cedar Valley). (from Roice Nelson's book New Technologies in Exploration Geophysics, 1983, Gulf Publishing). 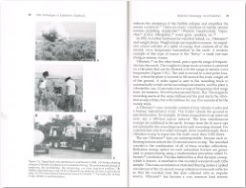 (Roice Nelson was the geophysicist in charge of this seismic acquisition for Mobil Oil, 1978-79). (0.2 seconds two-way travel-time is about 800 feet, the depth of most of the wells in Cedar Valley, this section is 3.0 seconds, or 15 times that deep). (across Blow-Out Pit interpreted in PowerPoint). 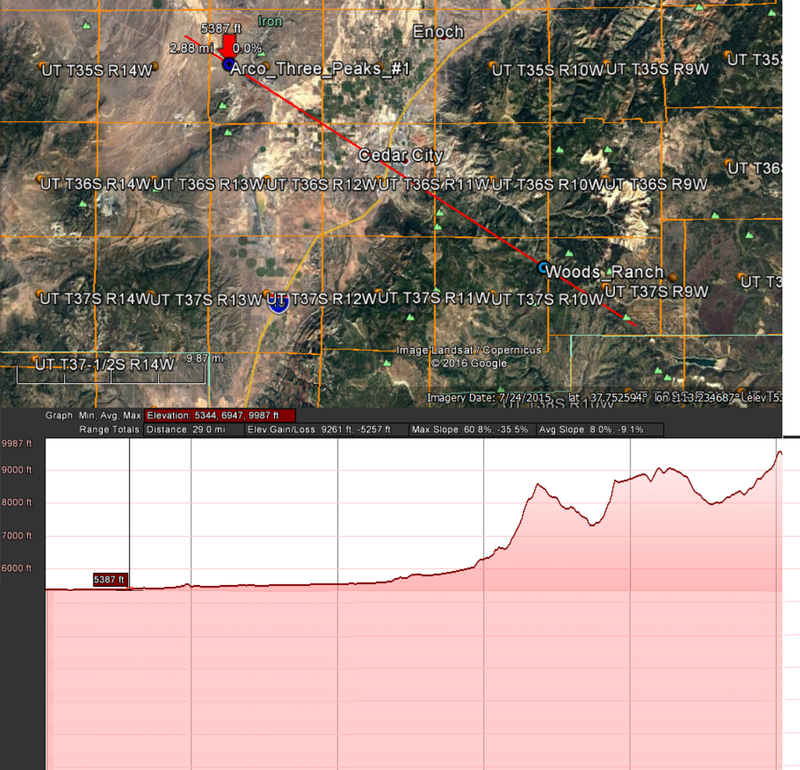 (Arco well to Woods Ranch interpreted in PowerPoint). (across Mobil seismic line 711 interpreted in PowerPoint). 26. 06 Sep 2016 Presentation given to Rotary: The Cedar Valley Aquifer and The Cedar Valley Drainage Basin. 25. 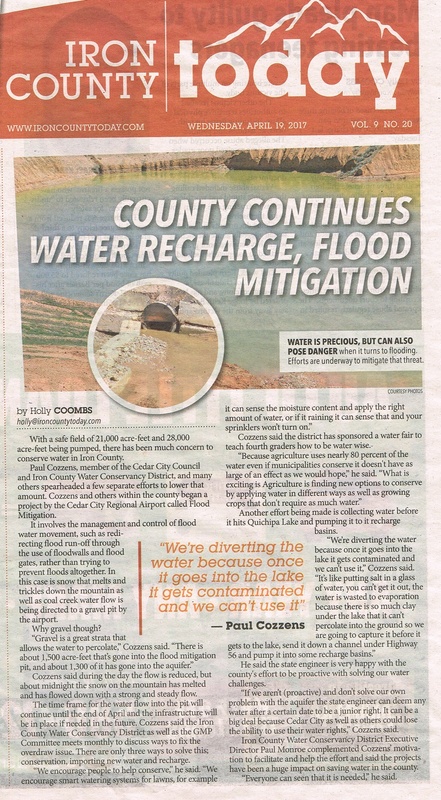 13 July 2016 Front and Back pages of letter from the State Engineer, Kent L. Jones, P.E., with feedback on written comments and questions regaring developing a groundwater management plan for Cedar City Valley. 24. 11 July 2016 Presentation Notes: The Cedar Valley Aquifer and The Cedar Valley Drainage Basin. 23. 11 July 2016 Iron County Commissioners Meeting Agenda. When Brent Hunter started to hand the handout given to the Board to Roice Nelson Thursday night, why was he stopped? What is in the handout to the Board, which is not in the attachments to the second above referenced e-mail from Kelly Crane? Is this public information, or is it political positioning? Why were there only 4 attachments to the initial e-mail from Kelly Crane? It is impossible to not think there is political positioning, based on how this "public information" transfer happened. Why were Gary Player and Roice Nelson not invited to participate in the meetings with the experts? It seems appropriate all notes on meetings with experts be made available to the public. The Salt Lake Tribune article below states that the West Desert is a "25 years" solution. 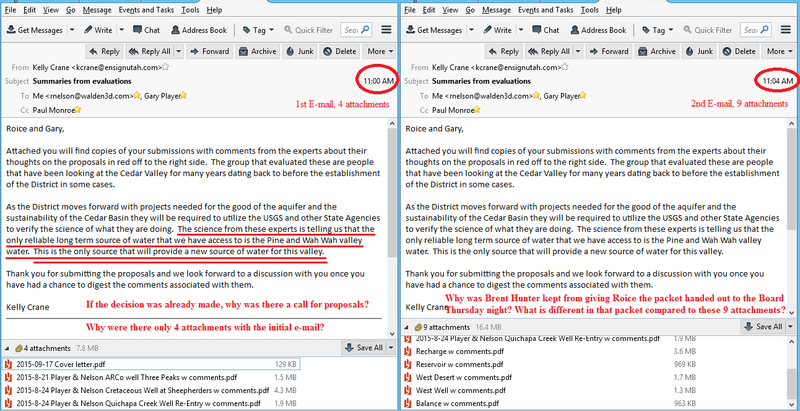 Did the word "sustainable" came from a recent e-mail to Paul Monroe from Roice Nelson? It is nice to see the word used, especially as this must become the goal. There is no question the West Desert pipeline is of long-term sustainable benefit to the Cedar Basin, however, there is a need to solve a 9,000 acre-foot per year over production of old (Lake Bonneville) water in Cedar Valley. The Aquifer Recharge option is critical, and it does not provide new water, it is recharging the aquifer so it does not collapse. Aquifer Balance will help the aquifer stability in the short and the long term, and, as stated in the cover letter, does not provide new water. 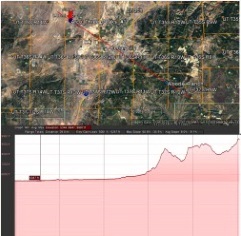 Player & Nelson are not convinced the ARCo Three Peaks well is connected to the valley aquifer. 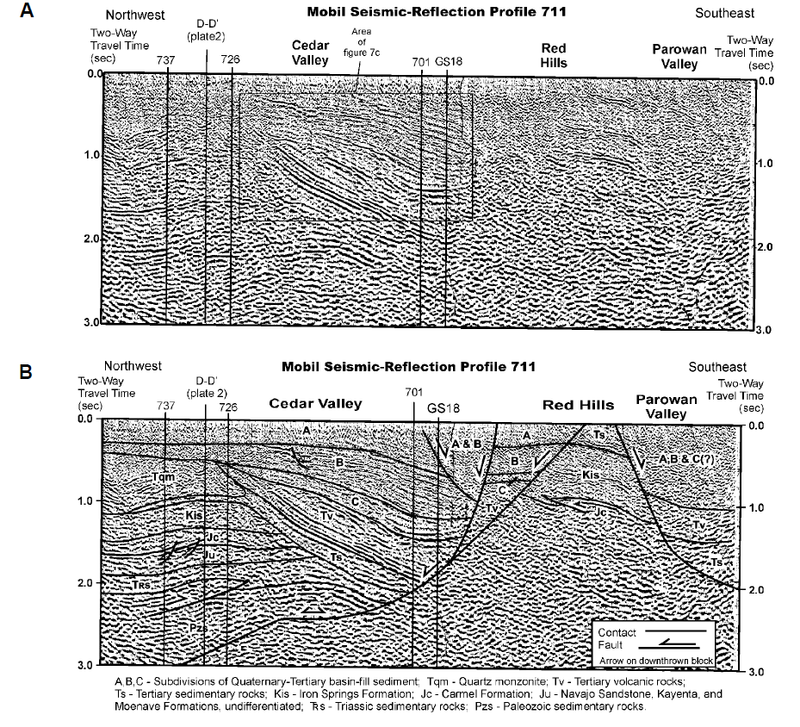 Age dating on water in the valley and from the well at New Harmoney into the Quartz Monzonite demonstrate these are different aquifers. It is nice to see the sustainable word used again. However, if Player & Nelson are right, the quartz monzonite aquifer, over 50 miles in length, is much more sustainable than any existing or planned water extraction project. Again, the age dating of the Quartz Monzonite well in New Harmony refutes the idea this well will be connecte to the Cedar Basin fill aquifer. If Player & Nelson are right, extracting water here would keep the water from draining out of The Great Basin. It is possible this well woul impact springs in the area. Proper measuring and monitoring will prove or disprove this supposition. 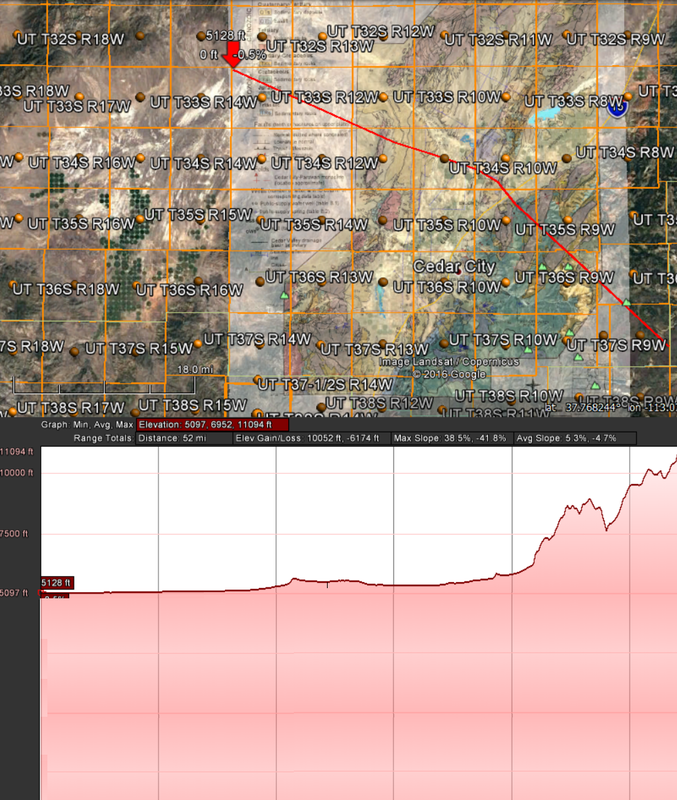 Player & Nelson do not believe the Cretaceous up Cedar Canyon is connected to the Cedar Basin fill aquifer. The Huriicane Fault separates these basins. 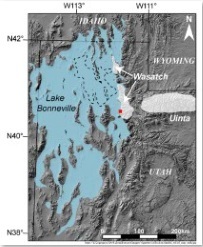 The fact all wells in the southern portion of The Great Basin are under normal hydrostatic pressure implies there is leakage from this basin to the Grand Canyon. 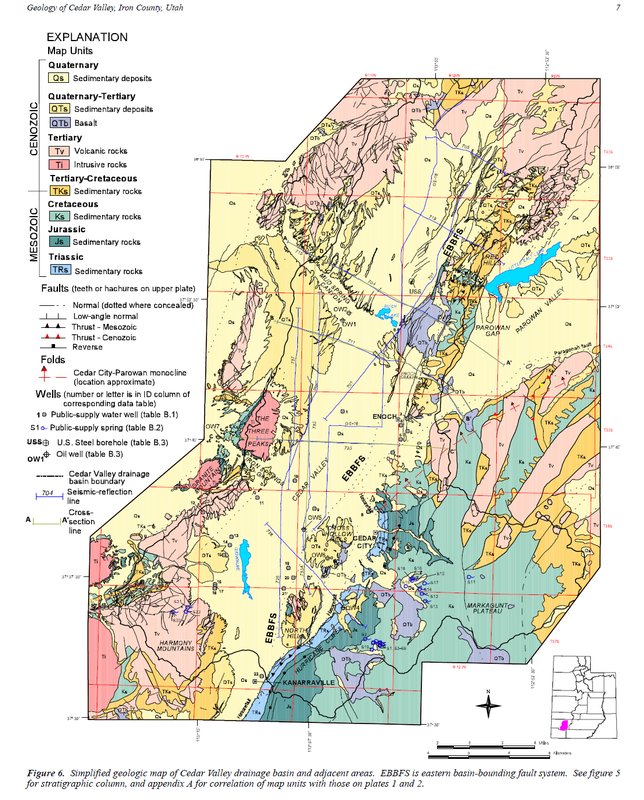 It is possible there is water from the Cretaceous entering Cedar and Parowan Valley near Summit, where the Cretaceous rocks are on both sides of the Hurricane Fault. 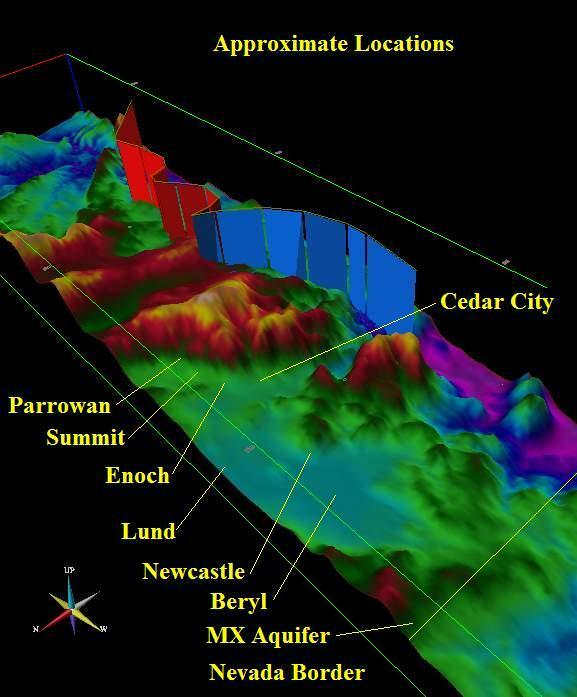 Age dating of water will help determine if Creatceous water is reaching Cedar or Parowan Valleys. 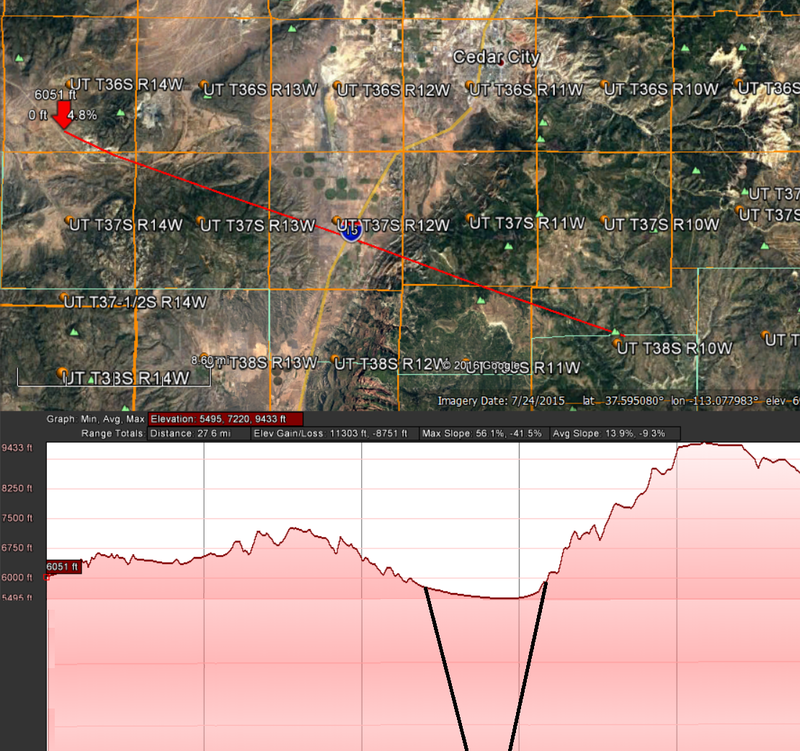 Because of hydrostatic presure, it is more likely droping down the Hurricane Fault and along the large faults can be seen on satellite maps to go to the Grand Canyon. Player & Nelson only submitted 3 of 9 outlined proposals, at the recommendation of David Miller, County Commissioner, so as to not overwhelm the system. One of those unsubmitted plans is for a reservoir up Cedar Canyon. It now seems appropriate to compare this proposal to the reservoir turned down during the evaluation. The fracturing within this is only on the very surface of these formations (wrong) and the likelihood of large water volumes within them is very slim (based on what?) and if a large volume of water was found it would most likely be finite in nature (wrong) and would deplete quickly as the wells proved for the Iron Mines just south west of the proposed well (please share this data). No time to comment before trip. 15. 6 Part Article in Iron County Today. 14. Integrating Cedar City & SUU Strategic Plans 20 Nov 2014 and to send to future@suu.edu. 13. Letter to CICWCD from Gary Player regarding the re-entry into the Arco well at Iron Springs to test the aquifer potential of the fractured quartze monzonite aquifer west of Cedar City. 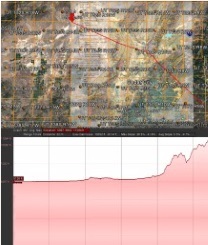 given to Brent Hunter of CICWCD to confirm thoughts about Cedar Valley and the Southern Great Basin being under normal hydrostatic pressure because water is draining into the Grand Canyon. from Gary Player & Roice Nelson, regarding the Cretaceous Aquifer on Cedar Mountain and a test well at Woods Ranch. 8. Keynote Talk at SUU Annual Research Symposium, 18 Nov 2013. Image from 2006 movie showing topgraphic differences to do a pipeline from the MX aquifers to Cedar vs. from Lake Powell. 3. 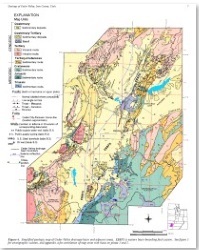 Folder dated 01 July 2006 with USGS pdf files, spreadsheets, etc. 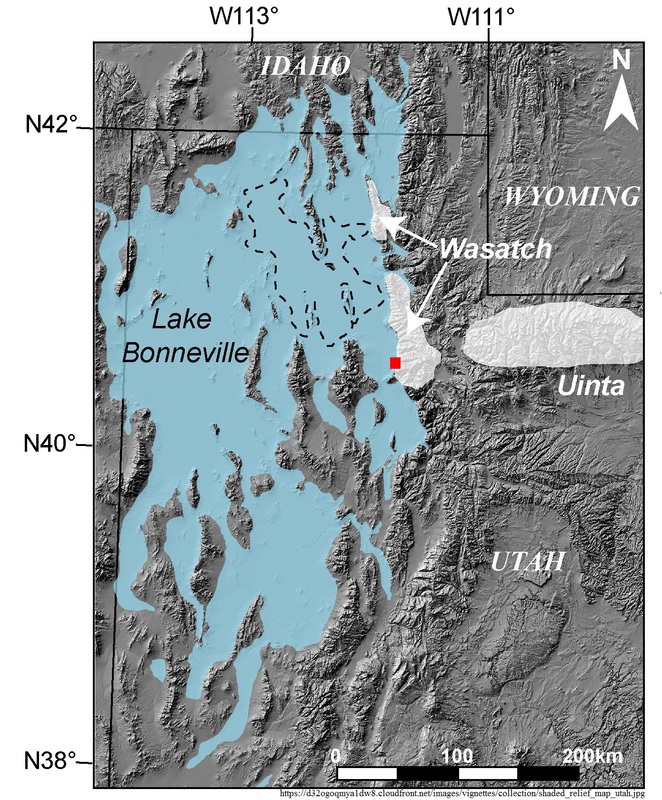 on White Pine County, NV and adjacent aquifers in Utah. 2.Second Presentation for members of the Central Iron County Water Conservancy Board, 06 June 2006. 2. Presentation for members of the Central Iron County Water Conservancy Board, 04 May 2006 revised from 1st draft. The "..." link typically takes you to the directory above. If there is an image, clicking on the image typically takes you to the next page. Clicking on the titles takes you to presentations. The blue bar above goes to a process map called the Knowledge BackboneSM, which is modified from a KB set up for oil and gas exploration, and which can be revised to be related to specific processes, like water, city, or university management. The blue bar below goes to a mapping index called the Infinite GridSM, which can be revised to be tied to local geological and geophysical and biological frameworks. These blue bars are a motif used at this web site, which web site has not been upgrated for several years. Copyright © 2005-2015 Walden 3-D, Inc.